First published in the Folio, 1623. Divided into acts and scenes. The last scene of the Folio, Scena Septima, has been variously divided by modern editors. The Globe editors, following Dyce, divide it into two, marking a fresh scene (viii) at Macbeth's last entry - "Why should I play the Roman fool," &c.
DAY 1. Act I, sc i. The Witches. They propose to meet with Macbeth after the battle, "upon the heath," "ere the set of sun." Act I. sc. ii. "Alarum within." We are, then, supposed to be within ear-shot of the battle. Duncan meets a bleeding Captain [Serjeant in the text] who brings news of the fight - Macbeth has defeated the rebels under Macdonwald, and is now engaged with the King of Norway. Ross and Angus [Mem. Angus does not speak nor is he mentioned in the text, and is struck out of modern editions] now enter. They come from Fife, and Ross announces the victory over Norway and Cawdor, Duncan commissions Ross to pronounce the death of Cawdor and to greet Macbeth with his title. Where is this scene laid? Modern editors say at Forres. I presume because in the next scene Macbeth, who is on his way to the King, asks, "How far is't called to Forres?" Forres is, then, within ear-shot of Fife. Act I. sc. iii. The Witches meet with Macbeth and Banquo upon the "blasted heath." Time near sunset, it is to be presumed, as agreed on in sc. i. Ross and Angus come from the King. Ross describes how the news of Macbeth's success reached the King, by post after post. He appears to have entirely forgotten that he himself was the messenger; he however greets Macbeth with the title of Thane of Cawdor, and Angus informs Macbeth that Cawdor lies under sentence of death for "treasons capital," but whether he was in league with Norway, or with the rebel [Macdonwald], or with both, he know not. Ross did know when, in the preceding scene, he took the news of victory to the King; but he also appears to have forgotten it; at any rate he does not betray his knowledge. Macbeth's loss of memory is even more remarkable than Ross's. He doesn't recollect having defeated Cawdor but a few short hours - we might say minutes - ago; and the Witches' prophetic greeting of him by that title; and Ross's confirmation of it, fill him with surprise; for, as far as he knows, (or recollects, shall we say?) the thane of Cawdor lives, a prosperous gentlemen. However, Macbeth and the rest now proceed toward the King, and here we must end the first day of the action, at near sunset. DAY 2. Act I. sc. iv. We are now, it is to be presumed, at Forres, on the following morning. Macbeth and Banquo make their appearance and are welcomed by the king. Duncan determines that he will hence to Inverness and Macbeth departs. Act I. sc V. Macbeth's castle at Inverness. Lady Macbeth reads a letter from her husband. This letter must have been written and dispatched at some time between scenes iii. and iv. Macbeth arrives. Act I. sc vi. The king is welcomed by Lady Macbeth. He has had a "day's hard journey" (see sc. vii). The scene is headed with the stage direction, "Hautboys and torches", yet Banquo talks of the swallows which have make their nests upon the castle walls, as though it were still day. The stage direction should surely give way before the authority of the text: torches is very generally omitted, but the whole direction was probably caught from the next scene, which is headed with a like direction. Act I. sc. vii. "Hautboys and torches." The service of the King's supper passes over the stage. Macbeth hesitates at the great crime he and his wife had agreed to commit. She now again confirms him, and they settle the details of the King's murder. The King has almost supp'd when Lady Macbeth comes to her husband. DAY 3. Act II. sc. i. Past midnight. "The moon is down." "And she goes down at twelve." Banquo and Fleance, retiring to rest, meet with Macbeth; they tell him that "The King's a-bed." Banquo mentions that he "dreamt last night of the three weird sisters." This last night must be supposed between scenes iii. and iv. of Act I.: there is no other place where it could come in. They part, and Macbeth proceeds to commit the murder. Act II. sc. ii. The same. Lady Macbeth is waiting for the fatal news. Macbeth re-enters with the daggers; he has done the deed. In his horror he dares not return to the King's chamber with the daggers; Lady Macbeth takes them. Knocking is heard within. They retire. Act II. sc. iii. The same. The knocking has aroused the drunken Porter, who proceeds to open the gate and admit Macduff and Lennox. It is yet early morning, but they have command to call timely on the King. Macbeth makes his appearance, and talks with Lennox while Macduff goes to the King's chamber. Macduff re-enters with the news of the murder. Macbeth and Lennox go to see for themselves, while Macduff raises the house. Lady Macbeth and then Banquo enter. Macbeth and Lennox, with Ross [how came Ross there?] return from the King's chamber. The King's sons, Malcolm and Donalbain, enter, to be informed of their father's murder, and that Macbeth has slain the grooms of his chamber as the culprits. All now retire, to meet again presently in the hall to discuss matters, save Malcolm and Donalbain, who resolve on flight. Act II. sc. iv. Later in the day Ross and an old man discuss the events of the past night. Macduff joins them, and we learn that Malcolm and Donalbain have fled, and that Macbeth has been chosen King and has gone to Scone to be invested. Ross determines to go thither, but Macduff will not, he will to Fife. An interval, the reasons for which are set forth in the comment on the following scenes, must now be supposed. DAY 4. Act III. sc. i. to iv. Macbeth is now established on the throne. In these scenes the murder of Banquo is plotted and effected, and his ghost appears at the banquet. The night is almost at odds with morning when these scenes end, and Macbeth determines that he will to-morrow, and betimes, to the weird sisters. Act III. sc. V. During the same day Hecate meets the Witches and apprises them of Macbeth's purposed, visit. We are yet but young in deed." And the first words with which Banquo opens this Act — "Thou hast it now," &c. — would lead us to suppose that a few days at the utmost can have passed since the coronation at Scone; in the same scene, however, we learn that Malcolm and Donalbain are bestowed in England and in Ireland: some little time must have elapsed before this news could have reached Macbeth. Professor "Wilson suggests a week or two for this interval. Mr. Paton would allow three weeks. "Lady M. Did you send to him, sir?" "Mac. I hear it by the way; but I will send." It is clear then that up to this time Macbeth has not sent to Macduff. DAY 5. Act IV. sc. i. We find ourselves in the witches' cave, on the morning following the banquet, and Macbeth fulfilling his purpose, then expressed, of consulting the weird sisters. It seems evident too that he cannot yet have sent to Macduff; for news is now brought him that Macduff has anticipated his purpose and has fled to England. Lennox tells him this news, and Lennox himself apparently has but just received it from the "two or three" horsemen who bring it; yet Lennox was informed of this and more in the preceding scene by the other Lord; he was even informed that Macbeth was preparing for war in consequence of Macduff's flight which he, Macbeth, now in this scene, hears of for the first time. On hearing of Macduff's flight, the tyrant resolves immediately to surprise his castle, and "give to th' edge of the sword / His wife, his babes, and all imfortunate souls / That trace him in his line," and accordingly. DAY 6. Act IV. sc. ii. Lady Macduff and her children are savagely murdered. We may possibly suppose for this scene a separate day, as I have marked it. Mr. Paton would allow an interval of two days between this and the preceding scene. 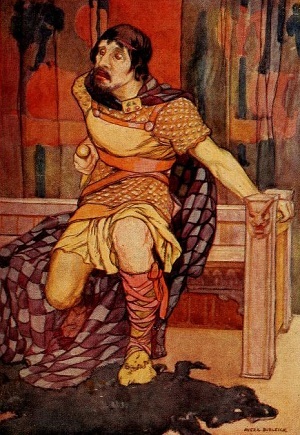 Professor Wilson fixes its time at "two days — certainly not more — after the murder of Banquo"; but the general breathless haste of the play is, I think, against any such interval between Macbeth's purpose and its execution; the utmost I can allow is, that it takes place on the day following sc. i. of Act IV. DAY 7. Act IV. sc. iii., we find Malcolm and Macduff. The latter has not long arrived. Ross joins them with the dreadful news. At his departure from Scotland "there ran a rumour / Of many worthy fellows that were out," and he had himself seen "the tyrant's power a-foot." In this scene in particular is to be observed the suggestion of a long period of desolation for Scotland from the coronation of Macbeth to the flight of Macduff; a period, however, which the action of the play rigorously compresses into two or three weeks at the utmost. Malcolm's power is ready, and they have but to take leave of the English king and start on their expedition. Act V. sc. i. At Dunsinane. Lady Macbeth walks in her sleep. "Since his majesty went into the field" this has been customary with her; but the Doctor has watched two nights and till now has seen nothing. The time of this scene may be supposed the night of Day 7. The mention of Macbeth's being in the field must refer to his expedition against the rebels; also mentioned by Ross in the preceding scene, where he says that he had seen "the tyrant's power a-foot." An interval, Malcolm returns to Scotland with the English forces. DAY 8. Act V. sc. ii. The Scotch thanes who have revolted from Macbeth, march to Birnam to join with the English power led by Malcolm, which we learn is now near at hand. We also learn that Macbeth is back in Dunsinane, which "he strongly fortifies;" it is clear, therefore, that a considerable interval must be supposed between sc. i. and ii. of Act V.
Act V. sc. iii. In Dunsinane Macbeth prepares for his opponents. We may fairly allow one day for these two scenes; although no special note of time is to be observed from here to the end of the play: they may be supposed to end the last "interval" and serve as an introduction. DAY 9 AND LAST. Sc. iv. The Scotch and English forces join, and march to Dunsinane screened with the branches cut in Birnam wood. Sc. v. In Dunsinane. The death of the Queen is announced. Birnam wood is seen to move, and Macbeth sallies out to attack his foes. Sc. vi. The combined forces under Malcolm arrive before the castle and throw down their leafy screens. Sc. vii. and viii. (one scene only in Folio). The battle in which Macbeth is slain, and Malcolm restored to his father's throne. Time of the play: nine days represented on the stage, and intervals. Day I. Act I, sc. i. to iii.
" 2. Act I, sc iv. to vii.
" 3. Act II, sc. i. to iv. An interval, say a couple of weeks. Daniel, P. A. A Time Analysis of the Plots of Shakespeare's Plays . London: Trubner, 1879. Shakespeare Online. 20 Aug. 2011. < http://www.shakespeare-online.com/plays/macbeth/timeinmacbeth.html >.